Skins with zones of penetration 'Red Star' 0.7.1 - Public-Enemy.nl - Schiet meer kapot dan je lief is! Division "Red Star" is his own pack of skins. Branch of the USSR: IP-7 IP-4 IP-3 IP, KV-5, T-54, Type 59, T-44, Object 704, ICS-152. The German branch: Maus, E-100 E-75, VK 4502 (P), Tiger II, VK 4502 (A), Lowe, Tiger, Tiger P, E-50, Panther II, JagdTiger, Ferdinand. The American branch: T30, T34, T32, T29, M46, M26, T95, T28. The French branch: AMX M4 (1945), AMX 50 100, AMX 50 120, AMX 50 B, Lorraine 40t, Bat-Chatillon 25t. Note: in the Tiger II and JagdTiger marked top and predtopovye guns. On the top gun T32 only one lane. Blue - the fuel tank. 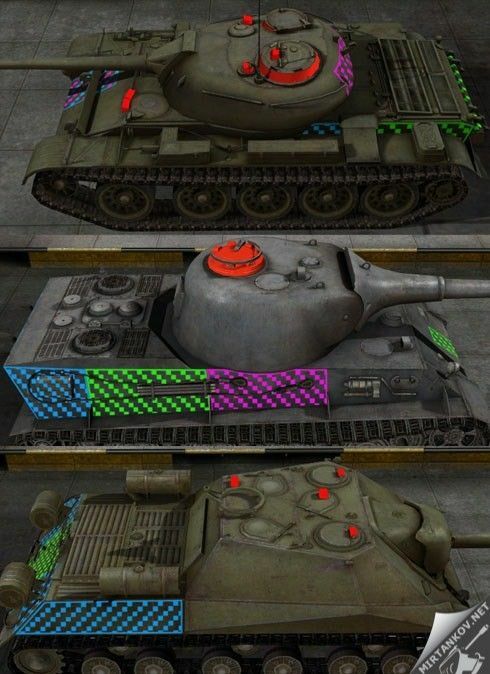 Installing skins: Copy the contents of the archive to a folder World of tanks. Optionally, you can make backup copies of replaced files!